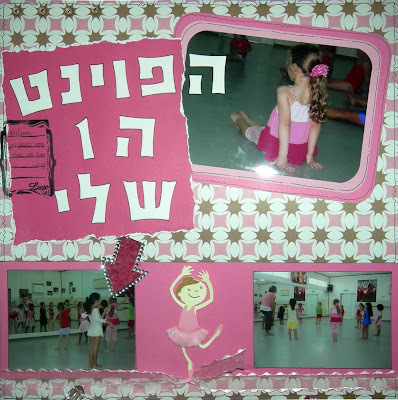 The journaling says: First lesson in dance class, with Nirit. I used: DCWV patterned paper, Sonburn cardstocks, Unity Stamp, Judy Kinz Diamond Glaze, bling, Scrappy Cat Journaling blocks clear stamp, ribbon, Sizzix - Girl in Ballerina Costume die, Cuttlebug, Sharpie, Kesem Art - Hebrew letters, Dew Drops. Yesterday I was in a scrap party, and I created 2 layouts. 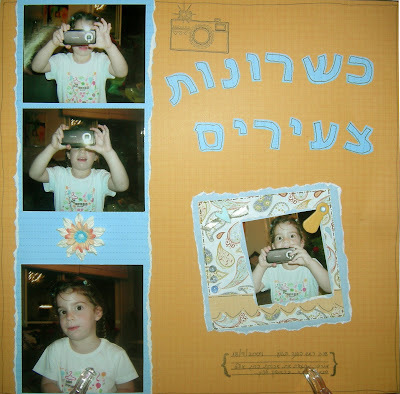 The pictures were taken on Rosh Hashana evening. I used: Sonburn cardstocks, Chatterbox patterned papers, Fiskars chipboard shapes, Unity stamp, Scrappy Cat Journaling blocks clear stamp, StazOn jet black, Sharpie, Dew drops, Prima flower, ribbon, brads.